They have a new machine! Whirlwind is gone, and Doctor Who is in. Nikki is going to make fliers this time. And the scoring will be different. Points per standing on each machine. Similar points system to the one-ball tourney we had there. Another Shorty’s come and gone! The underwater clown-themed hot dog bar hosted their 11th annual tournament this past weekend. We took the mega-van up to Seattle, with others taking cars and trains… all for one day of practice on their machines, and one day of competition. I think we had 14 or so from CFF? Plus friends from Portland. 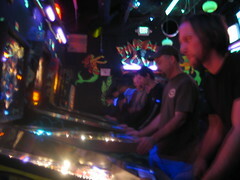 The machines played nice, 117 people entered, including three folks from IFPA‘s top ten, plus a bunch of other rippers. Not to be too negative, but the tournament itself is mostly excruciating and run like lousy (cramped space, then empty machines for hours as we all sit around waiting for the organizers to figure out our next rounds, single game rounds, etc.). Next time we’ll be bringing dominoes to help fill out the hours. That said, it’s no doubt a fun time. It’s great to connect with others in the pinball world, and especially, to see how the rippers play. Since the trip, our message board has been filled with lively strategy discussion. As usual, we managed to piss off a few wankers. One dude apparently burned one of our stickers, and so was dowsed with water. Holy crap! In the tournament the next day he experienced total karmic payback, with Gorgar, the unofficial God of Pinball, delivering a shocking slam tilt on Addam’s right when the dude was preparing to take a victory lap. Take that! I ranked highest in CFF in the tournament – around 16th or so, I believe – which was a bit disappointing for us all. We’ve shown better in the past. But it is what it is – most of all, it’s fun to compete. Our next trip up to Seattle will be for the 2nd Annual NW Pinball Expo (June, most likely). Eden from the Vancouver Regional Pinball Association told me about his grand plans for that show’s tournament, and it sounds like it’s going to be killer. It was run well last year (well, this year, still), and from the sound of it, 2009’s will be even better (extra prizes, a supplementary Electro-Mechanical tourney, etc.). The expo is supposed be larger, too (meaning, more machines to play, plus more speakers). Eric (EKH) did best of our Portland crew (9th or so). He even took out Keith Elwin (ranked #1 in the world) – on a barfbag Revenge from Mars. Eric’s organizing the upcoming Slabtown tournament in NW Portland. November 20th. This tournament’s going to be awesome. Make sure to get there on time, lazies! Speaking of tournaments! To make up for the lack of Taxi Tuesday’s lately, DropShot threw together a tournament at Ship Ahoy last night. $5 entry. For a last minute tourney, we had a fine field – ten entered. Danny Backglass, sporting a slick new H-cut, took home the pot. We’re hoping to do something like this on a weekly basis. Not everyone can make the bi-weekly meetings (including DannyB, most unfortunately), and so we’re making more efforts to fill in the time with some more events. Plus, we need more experience with competition! I’ll try to keep the calendar up to date. 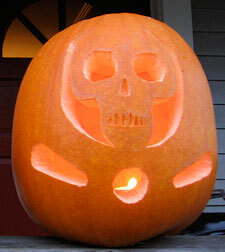 In conclusion, check out the pumpkin I carved!! More details (and a flyer) to follow. Hope to see you all there. So the date for the tourny is NOV 20th and its going to be on three machines (MM, FUNHOUSE, and SOPRANO’S). there will be a qualifying round from 6-8 pm then top 8 advance to head to head double elimination. the qualifying round will be play one game on each machine and points will be awarded for top scores (3 for 1st, 2 for 2nd, 1 for 3rd or however that works to get 8 people you get the point). Buy in is $5, pinball is free, with Slabtown promising 1st place min $100.00 (more pending how much is taken in buy in’s). then 2nd and 3rd could get ether money (if enough is raised) or beer and food or goodies not sure how ever it works. should be fun there is also a beat up Simpsons game to crush and a ping pong table so bring your paddles. Brenda and Sam who own Slabtown will be our hosts and they are good people, they also used to publish the zine MULTIBALL a pinball and music kinda mag and are friends of mine so it would mean a lot to me and them if we showed up in force and took advantage of the festivities. Also there could be some rival gangs there, I’ve crushed some OOO scores on their machines in the past so that could be fun.